CHDS instructors bring experts from around the world to discuss homeland security issues in non-traditional ways. 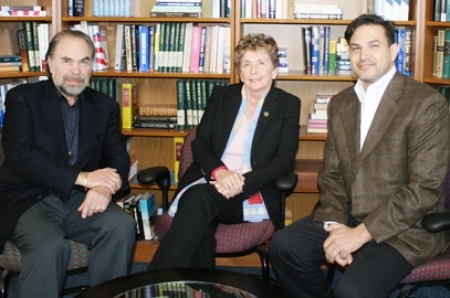 Dr. Kathleen Kiernan invited MCA Music Entertainment Group Chairman and CEO Al Teller, left, and Robi Sen, right, Chief Science Officer of Department13, a software consultancy, to speak to the Special Topics in Homeland Security course on March 30. Just ask record company executive Al Teller and technology entrepreneur Robi Sen. The two addressed Center for Homeland Defense and Security master’s degree students in the Special Topics in Homeland Security course March 30 with just that message — adaptive learning is an essential ingredient to innovation. During their four-hour session Teller and Sen discussed the correlation of risk and innovation and the importance of learning from shortcomings. A Harvard Business School graduate, Teller gained insight into problem solving while adapting to technological changes as the industry shifted from vinyl records to compact discs to the digital age. At the same time, he was navigating a sometimes fickle industry in which he worked with varied acts from the Rolling Stones to Bruce Springsteen, the 80’s band Fine Young Cannibals to country crooner Wynona. For Sen, missteps should be controlled and purposeful, as well as being mission-guided. For start-up companies so often resource-constrained and facing hurdles, a culture that nurtures acceptance of letdowns is critical to survival. Innovation also requires sound decision-making in a fast-moving and uncertain environment. During his class presentation Teller challenged students to engage in what he calls “Whole Brain Thinking,” a concept he finds necessary to finding solutions to complex matters. Too often, he said, leaders try to manage problems by viewing them flatly through their comfort-lens or, worse, “pressing your nose harder and harder into the wall” without varying one’s point of view. Clearly, change and risk take on different meanings in the public sector that is inherently risk-averse than in the private sector, as both men acknowledged. But they likened the intensity and motivation of entrepreneurs to the mind-set of the CHDS student composition, who excel in their profession and are driven to seek higher education within their already demanding schedules.